Online businesses have included email marketing as part of their strategy with good reason. Unlike other tactics that help increase traffic and engagement with users, email takes the personal approach in enticing their target audience to becoming clients and customers, among other reasons. More importantly, email marketing has reached new height due to the advent of mobile devices. According to Smart Insights, people check almost half their emails using their smartphones and tablets, a 500% increase from four years ago. With the surge of email marketing, one of your possible concerns now as web developer is to help clients get their site across as many of their target audience as possible through this tactic. This is done by getting visitors to sign up for your list and sending them newsletters on a regular basis. For this service, your clients may want to go to email marketing platforms that allow them to send out the email campaigns themselves, as well as design the email to be sent and the landing page where your site visitors can subscribe. However, if clients are looking for a specific type of design and layout for their email template, learn how you can provide responsive email templates to them using different tools and resources featured below. The issue that even good web developers have to face is the coding of the HTML email template, especially when subscribers are using Internet Explorer to view their email. Firefox and Google Chrome allow developers to debug the code using the Firebug and Google Inspect tools, respectively. This is an important feature to help developers make sure that the code of the template will show correctly on the browser. On the other hand, IE does not have the same feature that lets users inspect different elements and modify them in real-time to ensure that the template will show the right way. Not to mention that the templates will require the coding to accommodate the different iterations of IE, and you’re in for web development hell. Only the time-consuming and inefficient trial and error process of opening of the template in all versions of IE is the way to go. Enter Ink by Zurb. 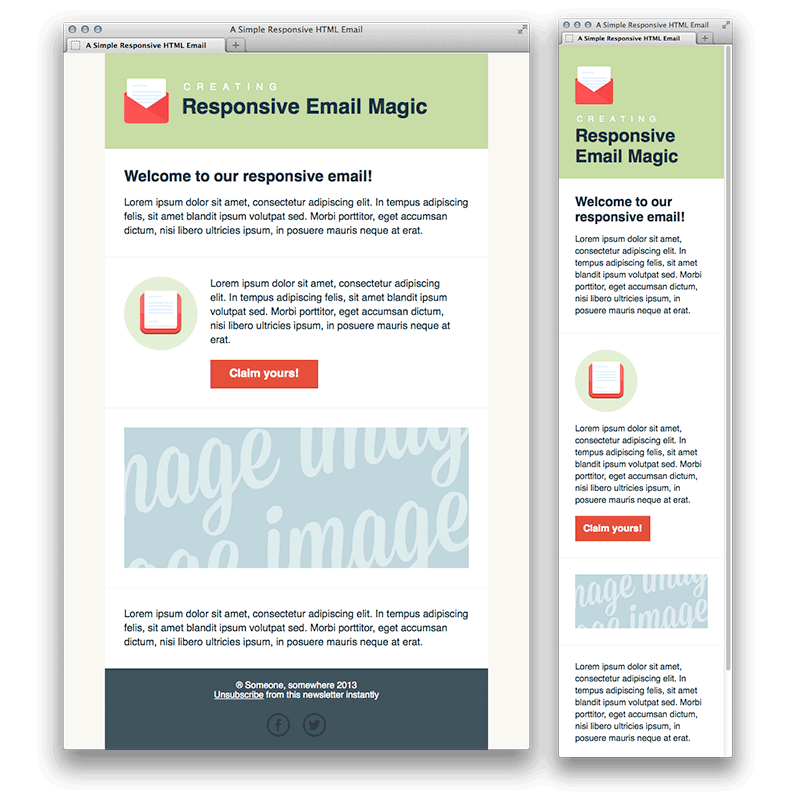 This responsive HTML email marketing framework runs on Zurb, the same people who built Foundation. The purpose of Ink is to simplify the process of building email templates for all devices and platforms by taking the principles of developing a clean markup without giving up on speed and quality. Ink offers a Responsive Email Design Training course on their site which you can view by clicking here. It covers the basics starting from learning where to code your email to getting your message out the door. However, you can also read this post over at Scotch.io that covers the essential things that Ink does in helping you build a responsive email template. However, instead of signing up for the course, below are stuff that you need to know about Ink that makes it an indispensable tool for developers in creating email templates. Another resource that you could refer to when creating responsive email templates is this one from tuts+. It opens up with the problem encountered by users who receive newsletters from their Gmail app on their mobile devices. While it is responsible for 11% of the emails opened but it never supports media queries. Since there’s good cause to believe that most of your subscribers will open your email using the Gmail app, they might hit t he unsubscribe button after seeing the broken mess of a newsletter they received from you. This is why you need to approach building an email template design using the fluid layout. This way, the elements in your newsletter won’t be broken even if it’s opened in your desktop or even the smallest of mobile phones today. This will be the final product of your email after following the steps in the tutorial (Image taken from the resource post). DevTips takes the complex workings of building a responsive email template and distills it into this easy to understand video. There is also a companion video tutorial to the one above that offers additional thoughts about the things that weren’t covered in depth or discussed properly in the original video. The video tutorial is geared towards beginners and is pretty basic considering the difficulty of the tasks. But consider this as a refresher course in coding for an email template anytime soon. Final thoughts: Creating an email template that’s responsive and adapts to the size of any mobile device will be advantageous to you as a developer. Since you will be familiar with your client’s theme and color scheme, you can simply apply them in designing the email template. Once created, you can simply import it to their preferred email marketing platform so they can send their email to their subscribers. Learning how to do this correctly will help you develop a skill in of your arsenal as developer, but also get more clients interested in your services, much to your delight.